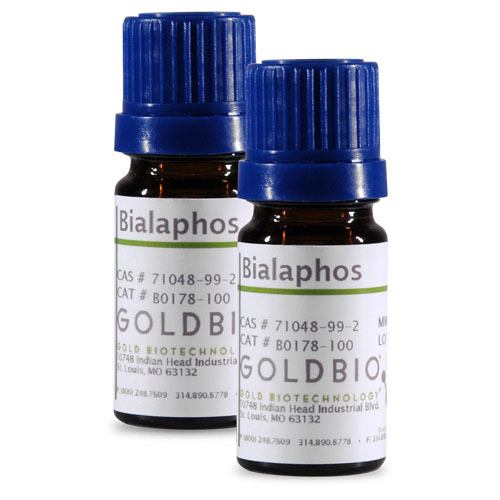 Bialaphos is a natural herbicide that is synthesized by Streptomyces hygroscopicus and Streptomyces viridochromeogenes. Bialaphos is made up of two alanine residues and the glutamic acid analog, phosphinothricin, and is commonly used as a gene selector in plants transformed with the bar gene, often called Basta gene. Bialaphos is typically used with cereal grains and is known to be more effective in corn and wheat than glufosinate (phosphinothricin). Bialaphos acts as a prodrug by separating into individual subunits of alanylalanine and phosphinothricin. Bialaphos is toxic to cells by accumulating ammonia and inhibiting photosynthesis and glutamine synthesis.